Dr. Patterson became the Superintendent of Schools for Prairie-Hills School District 144 beginning with the 2011 school year. Since that time, she has worked tirelessly to improve the lives of the students she serves, through community outreach, and partnerships, staff improvement, and increased educational rigor, and resources for students. As a result, she has been recognized by community and constituents for being an outstanding educational leader. This page is a tribute to her awards and accomplishments as an institutional and community leader. Dr. Patterson was honored on April 21, 2016 with Illinois Association School Administrators 2016 South Cook Superintendent of Distinction award. Dr. Patterson was selected by her peers based on the same four criteria that are used in the AASA Superintendent of the Year competition: leadership for learning, communication, professionalism, and community involvement. Prairie-Hills School District 144 is proud to announce that Superintendent Dr. Kimako Patterson has been selected as one of the Chicago Defender's Women of Excellence for 2014. Abundant Reign Ministries honors Dr. Patterson and Mrs. Veazey at their annual Markham Community Day 2014. Nob Hill honored Dr. Kimako Patterson for her contribution to the Education of Tomorrow's Leaders. Dr. Kimako Patterson was the keynote speaker for the National Sorority of Phi Delta Kappa Inc., Mu Chapter’s 55th annual Teach-A-Rama Education Conference on November 2, 2013 at the Illinois Institute of Technology, Hermam Hall. The theme of the conference: “Tools to Enhance Teacher Accountability” Dr. Patterson’s theme ”What’s In your Toolbox?” . 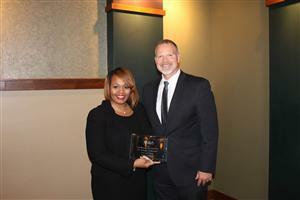 Dr. Kimako Patterson, Superintendent, was honored by Mayor, David Webb Jr. (Markham), for her visionary guidance and undaunting leadership on the construction and opening of the new Prairie-Hills Jr. High School. Dr. Kimako Patterson, Superintendent of Prairie-Hills Elementary School District 144 was awarded the Martin Luther King Jr., Spirit of Excellence Award in Education, from the Southland Ministerial Health Network, at a formal ceremony held on Monday, January 16, 2012. The Prairie-Hills ESD Community congratulated Dr. Patterson.